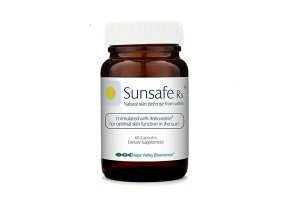 Sunsafe Rx Reviews - Is it a Scam or Legit? Sunsafe Rx is an anti-aging supplement that you take once a day, and is made up of sun protecting ingredients for the eyes and skin. It contains a propriety formula of antioxidants along with a broad-spectrum UVA and UVB protection to defend against the many signs of aging. Sunsafe Rx is offering a nutritional supplement that is designed to protect your skin and eyes from harmful UV rays. It is also manufactured and tested in an FDA-registered, GMP-certified facility. It contains a propriety blend of antioxidants which the company claims will provide you with a full-body coverage from the inside, and help prevent free-radical damage throughout. In addition to protecting the skin and eyes, Sunsafe Rx is claimed to also provide relief from symptoms of photosensitivities such as melasma, hyperpigmentation, and solar keratosis. Sunsafe Rx states on their website that for maximum effectiveness when taking this supplement, the recommendation is one capsule per day of continuous use over several weeks. You take one capsule about 60 minutes before sun exposure, although they also suggest you take an additional capsule for prolonged sun exposure. Could Sunsafe Rx Provide Some Protection from the Sun? Some of the core claims of Sunsafe Rx is that it protects the skin from sun damage which can present itself in many different ways and cover a wide spectrum of conditions such as wrinkles, scaly patches, melanoma, basal cell carcinoma, cataracts, age spots, and even freckles. From some of the research we found, one way to protect the skin against UV light is by adding a dietary supplement of antioxidants along with limiting your time in the sun, wearing sunblock, and a hat when necessary. According to a 2014 study conducted at the Heinrich-Heine-University in Düsseldorf, Germany, some efficient micronutrients are capable of contributing to the prevention of UV damage when used in combination with a broad-spectrum sunscreen. Based on the results from a 2008 study conducted by Clinique Laboratories, in conjunction with Case Medical Center, the addition of antioxidants like vitamin C and E, sourced through nutritional supplements such as Sunsafe Rx, may add value to sunscreen by enhancing protection and decreasing the UV-induce damage. Antioxidine complex appears to be the name for the company’s propriety blend of antioxidants which they source from plants and foods that are free from artificial additives. They say no sugar, sodium, soy, dairy, or preservatives have been added to the supplement. That it’s free from gluten and caffeine, and that the ingredients have been recognized as safe and approved by the FDA. According to the cumulative clinical evidence presented by sites like Natural Medicines Database, WebMD, and Examine.com, many of these essential vitamins and nutrients play key roles in immune function, cell function, preventing cellular damage, and even eye and brain health. However, they report there’s insufficient clinical evidence indicating that most of them can provide meaningful protection from UV damage for otherwise healthy (i.e., non-deficient) individuals. Zinc is an essential trace element that is essential for the body in small amounts. It can be found in meats and dairy products, in oysters, nuts, beans, and wholegrains. Zinc plays a role in eye health, wound healing, and immune functions. It’s often found in toothpaste and in nasal sprays to treat the common cold. Vitamin C is a water-soluble vitamin that is naturally present in some foods. Because the body is unable to synthesize it on its own, it has to be sourced from food and dietary supplements. Vitamin C plays an essential role in the biosynthesis of collagen, which is a vital component for wound healing, and it has been shown to regenerate other antioxidants within the body such as vitamin E.
Due to its antioxidant function and its vital role in immune function, ongoing research is being examined to see if vitamin C might play a role in the prevention and treatment of certain cancers. However, according to the National Institute of Health, there is inconsistent evidence on whether vitamin C intake can prevent cancer. In addition to many dietary supplements like Sunsafe Rx, vitamin A can be found in whole milk and liver, as well as in vegetables and fruits that contain a reddish-orange pigment such as, carrots, sweet potatoes, and pumpkin. Vitamin A is essential in bone growth, eye health, cell functions, and the immune system. Vitamin E can be found in foods such as vegetable oils, cereals, eggs, wheat germ oil, poultry and in fruits. Vitamin E is a powerful antioxidant that dissolves in fat and is used to treat respiratory infections, skin disorders, premenstrual syndrome, and is required for the proper function of organs in the body. Selenium is a mineral found in soil. It’s another powerful antioxidant that protects cells from damage. Some evidence shows that it may reduce the odds of prostate cancer. However, according to WebMD, selenium supplementation could increase the risk of non-melanoma skin cancer. An extract from a fern found in Central America that’s commonly found in UV-focused supplements like Sunsafe Rx. Some research suggests that this extract can be beneficial to take prior to sun exposure and can reduce the reddening of the skin and prevent skin damage. There is also reportedly some evidence suggesting that Polypodium leucotomos extracts reduce inflammation in people with itchy and inflamed skin and might improve symptoms of severe psoriasis. Part of the carotenoid family, Lycopene is a bright red, phytochemical found in various vegetables and fruits like tomatoes, watermelons, guavas, papayas, and grapefruit. It’s high in antioxidants that help fight free-radicals in the body. Omega-3 fatty acids are essential nutrients for human health and are good for your body and brain. Some common sources of fish oil come from cold water fish, like tuna, wild-caught salmon, herring, whitefish, sardines, and anchovies. You’ll also find omega-3 oil is some seeds and nuts, such as flaxseed and walnuts, and flaxseed. Sunsafe Rx Pricing & Refund Policy & Where Can You Buy? You can purchase Sunsafe Rx from the company’s website or on Amazon. It is available in three different sizes, and you have the option to make a single purchase or subscribe for a free lifetime shipping when purchased directly from the manufacturer. Regardless of the quantity, all direct orders come with an additional $3.95 S&H fee. We also found 30-day supplies of Sunsafe Rx sold via Amazon for about the same price. If you are not satisfied with your manufacturer-direct purchase, you can return it within 30 days for a full refund, minus the shipping and handling charges. Formulated by Napa Valley Bioscience, Sunsafe Rx states that the ingredients in their supplement have been proven to enable the skin to naturally protect itself from UV rays. As we can see from the clinical evidence reported by sites like WebMD and Examine.com above, though, there are definitely some nuances to the actual clinical support for this claim. With a 4.5 rating from Walgreens, Heliocare is a daily use, natural anti-aging supplement. It’s high in antioxidants and claims to help maintain the skin’s ability to protect itself from sun damage using just one ingredient: 240 mg of Polypodium Leucotomos per dose. Keep in mind that since Sunsafe’s Polypodium Leucotomos is part of a proprietary blend, there’s no way to know how its dosage—or overall effectiveness—compares to Heliocare. The normal price is $29.99 for a bottle of 60 capsules, however, at the moment, Walgreens has it on sale for $19.99. Heliocare appears to be cheaper at the moment than Sunsafe Rx, should you take Walgreen up on their discount. It does have a 4.5 rating as well, which could indicate that it’s a popular sun protector supplement. Another UV-focused supplement on the market is Murad Pomphenol Sunguard, a 60-day supply of which is priced at $36. The manufacturer also emphasizes that the formulation contains milk, which might not be suitable if you’re lactose intolerant. It has a 5-star rating on the Dermstore and Skinstore, along with a 4.7 rating on Amazon. Comparing it to Sunsafe Rx, it seems to cost more and does have a fairly high rating. It has a 3.4 rating on Amazon, and the Consumer Health Digest and will cost you $45 for a 30-day supply. Ceramiracle is a lot more expensive than Sunsafe Rx, with a lower rating than the other two supplements we mentioned above. Further research according to WebMD, suggests that foods vitamin E, one ingredient found in Sunsafe Rx, could prevent cancer growth as well as offer protection from the sun. In fact, they report that one study showed a significant reduction in skin redness after participants took a combination of beta-carotene (which isn’t included in Sunsafe Rx) and vitamin E over a 12-week period. However, researchers say they need more time to determine how much of the supplement is needed to get the protective effects. Pulling all of these details together, the big question is, could protecting your skin be as easy as popping a pill? To help summarize this answer we found an interesting article on The American Academy of Dermatology website, written by a board-certified dermatologist Henry W. Lim, and he has some interesting advice. Dr. Lim states that one in five Americans will get cancer in their lifetime, and that sun exposure is the most preventable risk factor when it comes to skin cancer. Despite this prevalence, he is optimistically cautious about a pill that contains multiple antioxidants actually helping to prevent UV damage since he agrees that each individual extract might have promising results, but there is no research to support their effectiveness when combined. Together, Dr. Lim states that while taking a sunscreen pill might sound convenient, seeking shade and wearing sunscreen is still the most reliable methods of sun protection. In line with the research, we found on sites such as The American Academy of Dermatology, PubMed, and Science Direct; it seems that a combination of sunscreen and a supplement such as Sunsafe Rx, along with a limited amount of sun exposure, could be beneficial in providing the body with extra sun protection. It also comes with a fairly competitive price and many consumers report having positive results by including a sunscreen supplement in their regimen. So, at the end of the day, if you’re interested in what Sunsafe Rx might offer, you can always give it a try, or your money back, minus S&H charges. Just keep in mind that to get the most bang-for-your-buck (and to ensure maximum safety), you should talk with your physician prior to starting any new dietary supplement, Sunsafe Rx or otherwise. Write a Review for Sunsafe Rx!